Provide comfort for the family of Wilson Sturgeon with a meaningful gesture of sympathy. Wilson, 81, of Oakdale, died Sunday, January 13, 2019, in his home. He was born September 5, 1937, in Oakdale, a son of the late Wallace L. and Cora Mae Wilson Sturgeon. Mr. Sturgeon was a member of Local Union #66 Operating Engineers. He was a member and past master of Oakdale F&M Lodge #669. He was also a past member of the Lafayette Centenial F&M Lodge of Carnegie, the Shriners, Tall Cedars and Amaranth. Surviving are his wife of 62 years, Lydia Dewell Sturgeon; children Karla (Late Michael) Thomas, Terri (Carl) Speicher,Wilson (Laura) Sturgeon, Jr. and Melanie (Steven) Koscelnak; grandchildren, Michael Thomas, Jr., James Hammerly, Jr. Kacey and Liam Sturgeon. He is also survived by two brothers, Wallace (Late Nancy) Sturgeon and Thomas (Joan) Sturgeon. Friends will be received Wednesday 2-4 and 6-8 p.m. in the Thomas-Little Funeral Service, Inc., 5000 Noblestown Road, Oakdale (724-693-2800) where the funeral service will be held Thursday at 11 a.m. In lieu of flowers, memorial donations may be made to the Masonic Village of Sewickley. 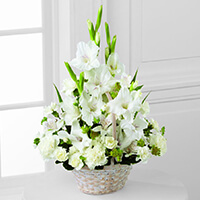 To send flowers in memory of Wilson L. Sturgeon, please visit our Heartfelt Sympathies Store. We encourage you to share your most beloved memories of Wilson here, so that the family and other loved ones can always see it. You can upload cherished photographs, or share your favorite stories, and can even comment on those shared by others. Mike, Jessica and Tyler sent flowers to the family of Wilson L. Sturgeon. Mel, so sorry to hear about your Dad. You and your entire family will be in my thoughts and prayers. Mike, Jessica and Tyler purchased the The FTD Eternal Affection Arrangement for the family of Wilson Sturgeon. Our deepest sympathy to Lydia and her children.I will always remember the smile and wave when he seen us.Fly with Angel's and rest with God Wilson you will be missed by so many.